Ione, Age 58, Administrative AssistantThe reason I went with Invisalign is because I’m not a kid anymore. I didn’t want to look like a kid with braces on, and have the hassle of keeping them clean. 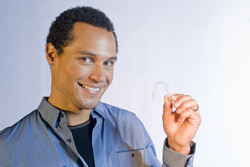 There is a lot of work to keeping your teeth in good health when you have traditional braces. Breanna, Age 20, Waitress & StudentWhat I like best about Invisalign is the fact that I can take them out and floss and brush my teeth and put them back in. So it’s not like I’m working around all this metal in my mouth, trying to get the toothbrush and floss in there. Gina, Age 31, Analyst RelationsI would not have gone the regular braces route because I am in a customer-facing position. I’m in the hi-tech industry, with a lot of people around me that are young and hip and moving and shaking. To be in management, in a hi-tech company with a mouthful of braces in front of customers and prospects and other executive partners, it just wasn’t an option.